Five "mules" who smuggled suitcases of cigarettes into the UK from Kuwait and evaded £250,000 in taxes have kept their freedom. Over a nine month period British border agency officials seized 15 pieces of luggage packed with cartons of 200,000 cigarettes which had no duty paid. Over the same time span, between June 2017 and March 2018, a further 19 suitcases, containing around half-a-million non UK duty paid cigarettes passed through border control without being detected. Newcastle Crown Court heard the illegal luggage had been carried by conspirators who had travelled to Kuwait for a short stay then returned to Newcastle Airport, via Heathrow. Callum Haggerton, 20, of Wear Street, Sunderland, Ethan Hyden,28, of Willow Road, Houghton le Spring, Gabrielle Joyce, 22, of The Cavalier, Silksworth, Sunderland, Leon Halliman, 21, of Windermere Street, Sunderland and Steven Parry, 50, of Oakfield Close, Sunderland, all admitted conspiracy to evade prohibition in importing goods without paying appropriate duties. Haggerton, who made four trips and evaded around £30,000 in duty, was sentenced to nine months imprisonment, suspended for two years, with 200 hours unpaid work and a three month curfew with £250 costs. 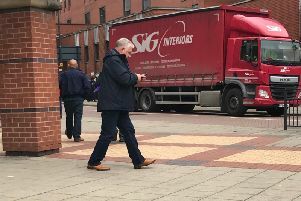 Hyden, who made two trips, was sentenced to 12 months imprisonment, suspended for two years, with 175 hours unpaid work and a three month curfew with £250 costs. Joyce, who made four trips and evaded almost £50,000 in duty, was sentenced to 12 months imprisonment, suspended for two years, with 200 hours unpaid work and a four month curfew with £250 costs. Halliman, who made five trips and evaded over £60, 000 in duty, was sentenced to 12 months imprisonment, suspended for two years, with 250 hours unpaid work, a four month curfew and £250 costs. Parry, who made just one trip, was sentenced to three months imprisonment, suspended for 12 months, with 100 hours unpaid work and £250 costs. Judge Tim Gittins told them: "You were all involved in a concerted, and I am satisfied orchestrated by others, plan to bring substantial quantities of non UK duty paid cigarettes into this country from Kuwait, by multiple suitcases load. "Each of you played a role, effectively as a mule, that brought, in a variety of numbers of suitcases each, for what amounted to, it would seem, for gain of just a few hundred pounds each. "Naively or otherwise, you took on the risk of substantial terms of imprisonment, for others and for a few hundred pounds." The judge said it was not a "faceless government" who lost out and told them: "What you were assisting in was taking from members of the tax paying public, each time." Defence barristers said none of the defendants have bad criminal records, have a positive future and had not realised the seriousness of what they were doing and are unlikely to offend again. Richard Herrmann, defending, said Haggerton, who lives at home with his parents, would have made just a "few hundred pounds" and he was not the head of the enterprise. Tony Davis, defending Hayden, said his client has a job offer that could secure his future and keep him away from any further trouble. Christopher Knox, defending Joyce, said the mum-to-be is "embarrassed and upset" by her involvement and had "no idea" how serious the offending was. Tony Hawks, defending Halliman, said the "young man" comes from a "thoroughly decent family" and had "succumbed to suggestions made by others". Steven Reed, defending Parry, said the court process has been a "significant, sobering experience" for his client after he "naively took a chance to make some money". The accused travelled back to Newcastle Airport from Kuwait, via Heathrow.